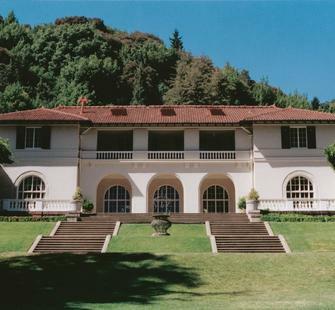 The historic Villa Montalvo at Montalvo Arts Center is a Mediterranean-style villa built in 1912 by former US Senator and San Francisco Mayor James Duvall Phelan. The Villa still retains most of its original architecture and has been beautifully maintained since Phelan's death, when he donated the property and surrounding grounds to the State of California as a place to cultivate art. Today, the Villa is a favorite site for weddings, and is the perfect venue for hosted luncheons, gatherings, and dinners. Tours of Villa Montalvo and the surrounding grounds are given regularly by volunteer docents.